I planted a few tomato seedlings this spring, and harvested most of them green last week when frost threatened. 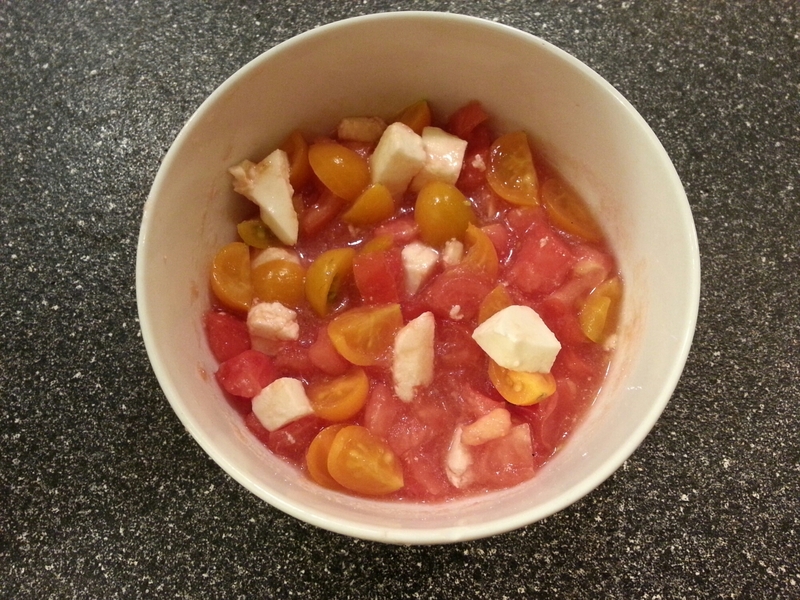 A bunch of them have achieved ripeness at exactly the same time, so I decided to make mozzarella salad today. The first time I had a salad like this was when I was an exchange student in Germany. My host mother made it because she knew I liked cheese, which was pretty darn nice of her considering what an ungrateful twerp I was at that age. A lot of people add fresh basil to this salad, but I think that it overpowers the taste of the tomatoes. I rarely add herbs, and when I do I almost always regret it. In past years I’ve had a plot in the neighborhood community garden, but it is far from a water source and I never was able/inclined to make the time for the labor-intensive watering that the location required. Plus, that particular community garden is terrible about policing weeding, and most years I would have neighbors on both sides that had weeds growing twice as tall as my tomato plants, preventing them from getting much sun. Over the years the community garden also developed a problem with tomato blight because people weren’t cleaning out their plots properly at the end of the year. This year, I planted six tomato plants in my front and back gardens. I’m pretty happy they turned out. 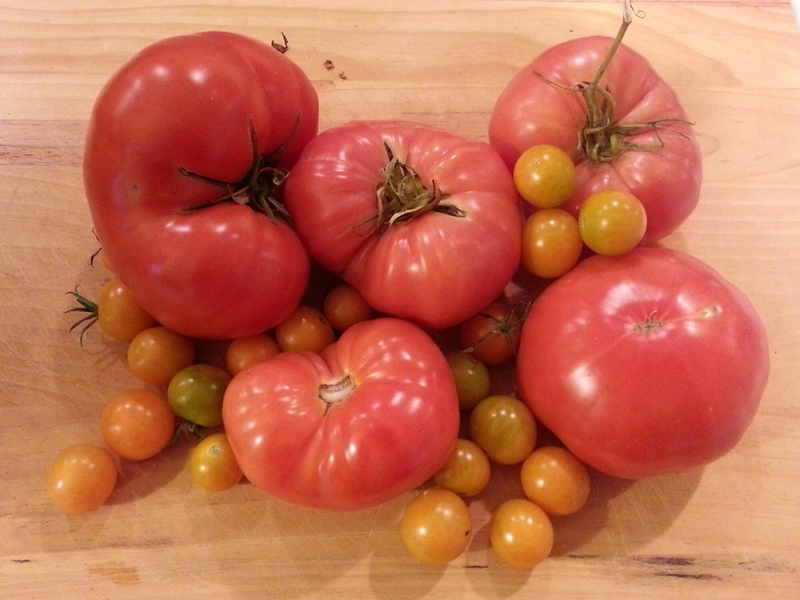 They produced comparably to my tomato plants in the community garden in previous years, even with the disadvantage of permanent partial shade and cooler temperatures this particular growing season. And they were a lot less work. Another thing I’ve done differently in recent years is purchasing and swapping for seedlings rather than growing them myself under grow lights indoors. I suppose it is more expensive to buy seedlings than seeds, but the seedlings I grew myself were always disappointingly small by the time transplant time came around. Plus, with cats around, you always have to worry about your seedlings getting dug out by the little predators. I figure I’m also not spending money on seed-starting mix, electricity for the grow lights, or a space heater/heating mat to keep the seedlings warm enough. Given the smaller scale at which I garden these days, buying vs growing seedlings is probably a financial wash. And it is so much easier!